This year Ultraist Studios and Possum Press have joined forces to attend. Listed under MAGAZINE MEWS Niche magazine publishers: Ultraist Studios / Possum Press will be located at booth MM5 which is located at 2 o’clock on the Queen’s Park Crescent circle. See map below for details. I have always heard good things from comic makers about Word on the Street. It will be interesting to see how many comics can be sold in a single day, and if it will be enough to make up the table cost. At least my weather widget assures me that tomorrow will be mostly sunny with a high of 22°C. In other news, the Ultraist Studio Store is debuting a SPUD & HARRY #1 / Creature From Jekyll Island special. More details and pictures to come. Click here for his tutorial. This is the situation from the Ultraist War Room: It’s been a slow going summer. Most of it was spent re-calibrating my life and recovering from working too many jobs. The bulk of 2007 has had me firing on all cylinders, and now that the year is 3/4 over, you wouldn’t know it even happened. Interesting. There has got to be a lesson to be learned in there somewhere… Luke 12:24 comes to mind. New Weapon For My Arsenal. 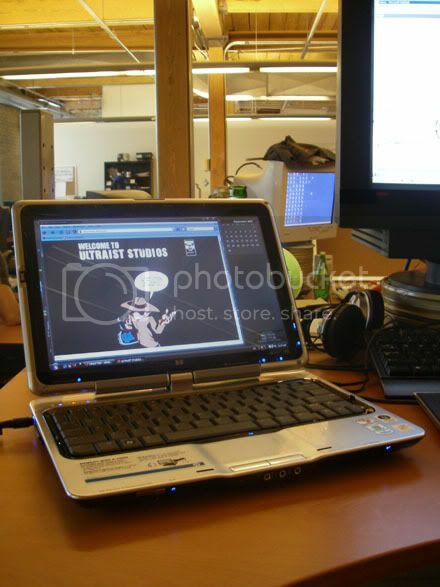 THE ALL NEW ULTRAIST STUDIOS PORTABLE WORKSTATION! It’s an HP Pavilion tx1228 which is fully equipped with everything I need to bring my comic work with me. Small enough to fit in my backpack, and powerful enough to run Maya and Photoshop full size comic pages. The wireless connection allows me to keep this blog up to date. As a matter of fact, this post is it’s first. Production on SPY GUY #1 has moved from pre-production into full production! Work has begun in transferring the rough layouts and script on to full 11 x 17 pages. Currently page 7 is in the works. Once location and character designs are 100% locked, inking on these pages will begin. I’m very excited about this one folks. Hope to do it justice. I have been craving more Curb Your Enthusiasm ever since I finished watching the previous 5 seasons on DVD. Add to that the recent divorce (which I thought would make perfect Curb fodder) and I was practically bursting at the seams. It doesn’t get any more George Costanza than that. And, now HBO tells me that Season 6 begins next week! Best news I’ve heard all day!